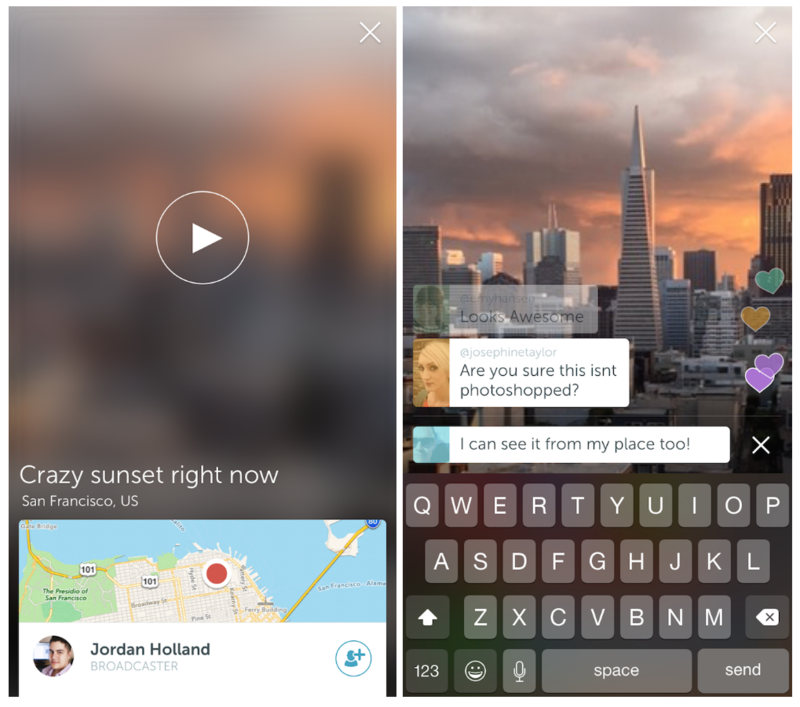 New app Periscope is on stage. Only for iOs, but already made a revolution. The old TV is history from now on. New TV is a Real Time TV and hyper-interactive, where users are broadcasters, participants, and viewers. Finally, the Revolution that ended the old world has arrived! It's called Periscope and was released 19 hours ago. Among the first in Italy, I saw Fiorello, an Italian showman, who was clever enough to put in the title the hashtag #periscope in order to appear in searches. Insofar as I can in my small way, I have made my first broadcast from my balcony early in the morning, as you can see in this foto, and without saying the word. I did it on purpose to remember the first silent films, to emphasize the historical distance between two events. 45 live viewers and 28 hearts. Not bad for the view of the courtyard and the pigeon. To explain what it is in practice, it is similar to the old TV for the fact that somebody is 'transmitting', but all the rest is different, as being hyper - interactive, unlike the old TV that made us passive consumers, here YOU are TV! Each user is the broadcaster! The experience is to live in a direct transmission, in real time, from any part of the world and what you want. And not only. While transmitting, people interact with you and ask you questions like in a chat - writing - and you answer speaking, being a broadcaster! If they like your story, they will touch the screen on mobiles and will assign you hearts, floating on the screen in the color of your profile. You can choose the transmission by 'place' or 'title' or by 'name' that is the same as Twitter account. Because Periscope belongs to Twitter, on Periscope you have your Twitter name. Application is now only on iOs, but soon will come also for Android. Remember when Facebook acquired Instagram? Then you understand the type of union. But here there's more! You know that one swallow does not make spring. So, talking about the Revolution, behind this historical event is also a historic agreement, I�d say, because Google and Twitter become a partner! Why Twitter has allowed Google to enter its " firehouse", providing access to the stream of Twitter and its 9,000 tweets per second?. What does this mean? Nobody wants the old information... Google is "Information" par excellence. Talking about the �old� information, I am referring to information of an hour ago! I�ll talk more about this in another article. What comes out of this agreement is important - what counts is: NOW! REAL TIME! Periscope as an idea was born about a year ago from the idea of Kayvon Beykpour and Joe Bernstein, who wanted to create a vehicle that would allow to see the world through the eyes of others, something approaching the teleportation! Maybe, but here to be teleported in history are the classic TV that will make its �noble� closure step by step. Maybe now we do not realize, but the classic "journalist", the role, now goes down in history along with the �imposing" TV, to leave the main role to interaction, to direct communication. Now it�s the two-way road. The well-known Serbian poet Branko Miljkovic once wrote : "One day everyone will write poems". That day has arrived, maybe not all are the poems, but the world will be smaller and will fly in education as the jet (see video - link below). If I think this way, it�s because I can see the positive in this historic event, the beginning of a better world for all. The endless struggle between those who are attracted by death and others attracted by life goes on..., but this is a big step forward, a positive step for those who want the same opportunities for all. Provided if we are ready to invest in the Knowledge - the goods of the new world. Leaving behind the "World of Things". Note: This is translation of my article written for my TeslaLUX site in Italian - ARTICOLO IN ITALIANO. Giorgio Tani era un mio cliente per il quale ho fatto diversi lavori di Social Media Marketing. Abbiamo iniziato a collaborare nel 2014. Ci siamo incontrati diverse volte per parlare dei progetti che avevamo in corso, degli artisti, web e il mondo della musica. Questa foto qui � dal nostro incontro dove ho conosciuto Alessia Ramusino, la cantautrice di grande talento, che Giorgio aveva deciso di produrre. Mi diceva che voleva restituire alla musica, almeno in parte, ci� che aveva ricevuto. In cantiere aveva altri due progetti cantautorali, uno con un musicista poeta e l'altro con una band. Nell'ambiente era noto come produttore e manager storico della band Ricchi e Poveri, il gioiello dell'industria musicale Italiana. Giorgio Tani era un uomo riservato. In tutti gli anni della sua vita dedita alla musica non aveva rilasciato nemmeno un' intervista, tranne questa a me. Era sempre in viaggio per i Ricchi e Poveri, come anche per per molti altri, dedito al 100% al suo lavoro. Se era per la causa, era disponibile anche a cimentarsi nelle questioni di tecnologia. Non si � tirato indietro nemmeno quando c'era da conoscere qualche cosa nuova su Mac e l'iPhone, anche se non era un'innamorato delle nuove tecnologie. Cos� dai viaggi mi aveva fornito diversi video dei Ricchi e Poveri fatti dal back stage, e le fotografie dei momenti cha ha saputo catturare con l'occhio da artista. Penso abbia avuto un grande talento per la fotografia. Sapeva osservare e catturare dei momenti importanti. Grazie a lui ho conosciuto Ricchi e Poveri molto bene, senza averli mai visti dal vivo. Dalla nostra collaborazione sono nati i siti web, la pagina Facebook, gli account di Twitter ed altre reti sociali per la sua discografica BMA Music, nonch� la distribuzione mondiale dei CD, il piazzamento dei video su VEVO ed altro. Quello che si potrebbe definire come trasferimento dell'impresa "terrestre" sul web. Anche se del web non era tanto convinto, sapeva che era necessario. What you see on the foto are four sides of my world/my bio, that I have decided to make visible because it's about my work that is my mission. And because it's all about uniqueness and meaning. If you want to help the others to make their invisible visible, you also need to make yourself visible. Did you know that there are no two people with the same fingerprints? Even if there are 7.3 billion people on Earth each person is unique. Even identical twins with the same DNA have different fingerprints. It's our "what, how and why", our "Human Alphabet", where the lines on our palms are our signs of greatness. What many people don't know is that this has to do with our "Vinca Alphabet", probably the oldest world alphabet, discovered in one locality near Belgrade, Vinca, that gave birth to our, Serbian, Cyrillic Alphabet. I have arrived at this point thanks to the years of research, and after graduating in Literature and the Theory of literature, which brought me to look deeper into signs and symbols, or in one word to Semiotics, in connection to processes and meaningful communication. Arriving to connect the oldest alphabet at one of the oldest human disciplines, Hand Analysis, gave me the final light in understanding the links between nature and ourselves. This became the base of my Life Coaching. We are all born literate, as professor Radivoje Pesic said, but to "activate" our resources and apply them in our everyday life, we need to cross one very special inner path. More about it in my book "God's Alphabet - it's all written on our hands" (already in Italian), soon in English, together with articles that will explain better this field. To activate our resources, it is very important to start early or to be fast. Without Culture there is no Human Progress. Be or not to be - no question: BE! Be the Culture! This is how the first Yura Borzoi Publishing House is born. Instead of a steady job and certainty after graduating, 'a dreamer' has decided to challenge the giants of the state publishing at the very beginning of the free market in the country. Being the first women in Yugoslavia to open a Publishing House, even if under the 'benediction' of the great poet Desanka Maksimovic, was also a sign of being "foolish". The first book was about the signs on our palms, naturally, and being born under a good star, sold more than 100.000 copies in its "lifetime". Yes, I like to think about books as a living creatures. All was at the best possible way in Belgrade until we arrived to 'our turn' to make war, as it seems we are geo-politically always on the crossroads. Then I moved to Italy, Milan. It took me 20 years of fight, successes and also the failures and, fortunatelly, rebirth to arrive at the second Publishing House, under the same name. This confirmed that Steve Jobs was right: when you are hungry and foolish, your dream will become reality! This is exactly what happens with all that is invisible! Invisible at one point becomes visible! How is it possible? Simple: we need an imperfect action! You know Nikola Tesla? Well, his family lived close to the place where my family comes from. For all of us kids he was a myth, a superhero. He was able to see clearly all his inventions as real. Seems that for many of us there it was the same. When you live in the specific conditions you cultivate your talent and by the time it becomes an important skill, when you are able to transform your inner "flights" from a "dreamland" into reality. I had several of those "flights" that became projects. "Milano Virtuale" (Virtual Milan) is one of them. It was two years before "Second Life" was born. This I consider "Physic Virtuality" (video). The other one is "Psychological Virtuality" and here I'm talking about Social Networks and it has to do with my TeslaLUX.com site, with Branding and storytelling. But also WebMetropolis.org with artists and their work, discovering some new signs of greatness. TeslaLUX, the Light of Tesla, how could I call my business that is my mission, if not so? Whenever it was hard I was talking to him in my heart. One has to live proper uniqueness. Means that one should also have the right to do it differently, using proper talent and skills to make the invisible visible. And as it is hard to do it alone, here we come to my work with artists. Because Tesla LUX is dedicated to the solutions and strategies, helping creatives leverage brilliance, how I decided to define my work and mission. The most important is the knowledge, the goods of our days, not to confuse with the information, that is just a 'raw material'. Knowledge and experience. As Huxley said: �Experience is not what happens to a man; it is what a man does with what happens to him.� This is how "story" becomes "brand". But more about my work when my site reopens, with its brand new "shoes". I hope you will have fun discovering with me the Signs of Greatness in others and maybe find something useful for yourself. NE SUPRA CREPIDAM SUTOR IUDICARET. Come promesso vi dimostro che baciarsi in bocca tra le persone di stesso sesso non significa essere necessariamente gay e che � un comportamento con il quale si esprimono quanto i sentimenti, come amicizia e fratellanza, altrettanto si sigilano le alleanze o conferma l'appartenenza alle stesse idee.